The internet provides access not only to information, but also to each other. Taking the social life of health information to the next level. This report is based in part on a national telephone survey of 3,001 adults which captures an estimate of how widespread this activity is in the U.S. All numerical data included in the report is based on the telephone survey. The other part of the analysis is based on an online survey of 2,156 members of the National Organization for Rare Disorders (NORD) who wrote short essays about their use of the internet in caring for themselves or for their loved ones. NORD represents the approximately 25 million Americans living with a rare disease, which is defined as affecting fewer than 200,000 people in the U.S. The people who participated in the online survey reported a wide array of conditions, such as Marfan’s Syndrome, congenital hyperinsulinism, and aplastic anemia, to name just a few. In reading those essays, it becomes clear that the people who responded to the survey have taken the social life of health information to the next level. Many of them forged a long path toward a diagnosis (if they even have one) only to find out that this was simply the start of another journey. People living with rare disease, their own or a loved one’s, have honed their searching, learning, and sharing skills to a fine point. They endlessly scan resources for clues to try to cope with and mitigate the inevitable complications and setbacks that come from rare diseases. What was once a solitary expedition for one person or one family, however, has become a collective pursuit taken on by bands of brothers- and sisters-in-arms who may never meet up in person. 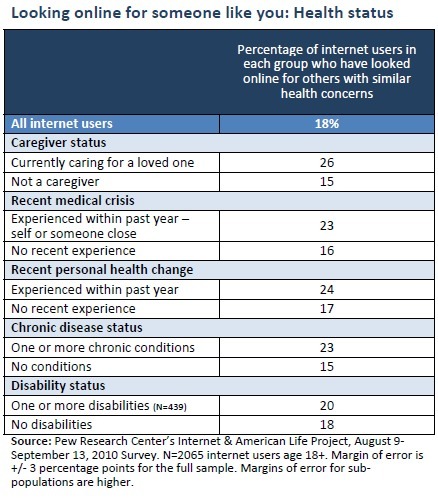 One in five internet users (18%) have gone online to find others who might have health concerns similar to theirs. Internet users ages 65 and older are less likely than younger internet users to have done this (10%, compared with 18% of those ages 50-64, for example). Spanish-dominant internet users are also significantly less likely than English-dominant internet users to have looked online for someone with similar health concerns (6%, compared with 19%). Twenty-three percent of internet users living with chronic conditions have looked online for someone with similar health concerns, compared with 15% of those who report no conditions. In the survey, we asked about chronic conditions in two ways: First, we asked people if they had one of five conditions: high blood pressure, diabetes, lung conditions, heart conditions, or cancer. All of the internet users who had at least one of those conditions are equally likely to have looked online for someone with similar health concerns. Our second strategy in looking at chronic disease was to ask people if they had any other condition besides the one we mentioned. Some 17% of respondents say they do. It is intriguing that a greater proportion of these internet users living with less common, chronic health problems have gone online to find others with similar health concerns. Thirty-two percent of internet users in that group say they have done so, compared with 15% of internet users who have no chronic conditions.